Dessert doesn't get any better than this! MUSIC NOW PLAYING: - "Baklava"
1 box frozen fillo dough [available in most markets] need 10 sheets. Mix clarified butter and Crisco¨ together, heat and then set aside until ready to bake paklava. Take a loaf pan [not Teflon¨ about 12 X 12 x 2 inches and spray with non-stick cooking spray and place upside down on 10-12 sheets of fillo dough. With a very sharp knife, cut around the pan to make dough the same size as the pan. Separate fillo dough sheets carefully and dust with cornstarch if necessary. Place 5 sheets one at a time into the pan, buttering each sheet. Now spread an even layer of the walnuts, sugar and cinnamon which have been mixed together. Now place the other 5 sheets of dough on top of the nuts, buttering each sheet. With a sharp knife, cut the stack of dough into diamond shaped pieces [about 25-30]. Generously brush the butter/Crisco¨ mixture over the dough and then bake in a 350 degree oven for 10 minutes. Remove from the oven and brush the rest of the butter/Crisco¨ mixture over the dough [this makes the dough rise]. Bake again for 20-25 minutes or until a light golden brown on top. Remove from the oven and let cool. To serve, drizzle warm sugar-lemon-honey syrup over the top. Do not syrup too long in advance of serving, or paklava will become soggy. Combine the sugar, honey and water and cook for 10 minutes. Add lemon juice and cook for 2 minutes. **The following is an e-mail from a viewer, who adds a little light on the subject of Pahklava's origins. I enjoyed visiting your site, and recognised some of your recipes. I have one comment about your describing "Pakhlava" as Greek. 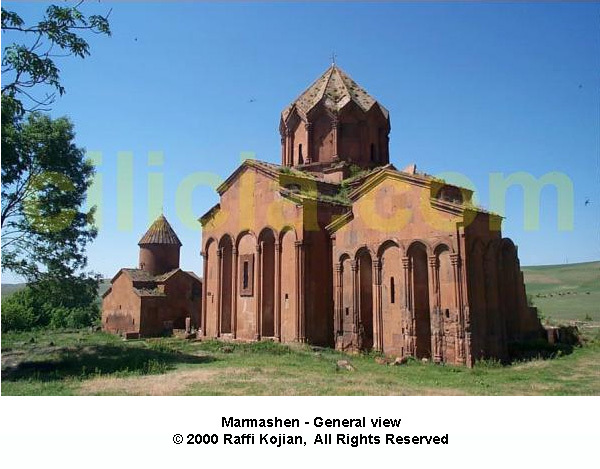 I can share the following anecdote with you, and you can come and visit the Armenian churches built by the "Pakhlavounis" in Armenia any time you like... Let me know. ..." have been very busy and did not have time to write, but I had a delightful week. Great project ideas and meetings with such exciting people, Armenians, young and young at heart. I will share with you my impressions of a visit to Kyumri (sometimes written Gyumri or Gumri). Kyumri used to be Armenia’s second largest city before it was destroyed by the earthquake of December 1988, for which we have collected money in Ottawa and across Canada. If you remember, the Soviets had called it Leninakan then, changing the name from Alexandropol, which was given to the city by the imperial Russians. It is now called Kyumri again, but was historically called Ko-Mayri, in memory of some famous words pronounced in battle by Prince Vahram Pakhlavouni, in 1047, before the fall of Ani (80 kms away) to Alp Arslan’s Seljouk Turks. Prince Pakhlavouni, although very brave (he died sword-in-hand in that battle together with his son Krikor), did not use very polite words when he met face to face with a huge Turkish bashi-bouzouk who was hurling insults at him from accross the Akhourian river. Prince Pakhlavouni, picked-up a spear aimed it at a spot between the eyes of the bashi-bouzouk and threw it at him shouting: ‘ays al ko mayri’ (and this one for your mother). Ko-Mayri became the battle cry of the Armenian troupes and they were able to repel the invading Seldjouks then, but as we know, not for very long. Some of the people who escaped from Ani ended-up building the new settlement: Ko-Mayri. I visited the tomb, 8 kms north of Kyumri, where Prince Vahram Pakhlavouni and his son Krikor are buried. (see http://www.cilicia.com/armo5_marmashen.html ). They lay peacefully in front of the beautiful church of Marmashen Vank, which was recently renovated thanks to a grant by the Italian Government. The tombstone is cracked and I would not have been able to decipher the inscriptions had I not had the help of this wrinkled-faced old Armenian villager, Seriosh, who guards the church and the surrounding park at the corner of this beautiful creek (Azat) with lovely water falls, and the Akhourian river. I went swimming under one of the waterfalls. It was great! Seriosh seemed very knowledgeable and he told me so many anecdotes about that part of Armenian history, and about the Pakhlavounis that I had never heard before. I will share one of them with you. Apparently the Pakhlavounis were very famous in that period. If you remember the Katoghigué and Ketcharis Churches that we visited in Dzaghgadzor, these were also built by some other Pakhlavounis. The ancestor of the Pakhlavounis was a very smart peasant with an appetite for good food and a good sense of marketing. He liked so much the ‘Tertanoush’ that Movses Koshkerian used to bring to church; he stole the recipe and started commercialising the pastries under his own family name, calling it «Pakhlava». As we now know, pakhlava was adopted by many cultures in the region, but by then, the Pakhlavounis had become very rich and their descendants became brave princes, who gave us beautiful churches. Unfortunately, only the main church chapel in Marmashen was renovated. Two other beautiful chapels destroyed by the 1988 earthquake stand next to it, but the walls of the houses surrounding the vank (monastery) can hardly be distinguished from the rubble. From the Vank, I can see the remains of the Vahramabert fortress (named after Vahram Pakhlavouni) on the Akhourian river, one mile away. ..."